An improved means for rapidly compressing, expanding, and displaying broad band information which is transmitted over a narrow band communications channel. In the preferred embodiment, a video image is cyclically assembled in low resolution and high resolution phases from digitized data representing gray level intensity for individual pixels which have been grouped into cells. During the initial cycle of the low resolution phase, a representative sample of said cell intensity values is transmitted by a sending station to a receiving station according to a video compression routine. Said receiving station then uses a video expansion routine to calculate an intensity value for those cells and pixels whose intensity values were not transmitted and displays an initial image. This image is refined during subsequent low-resolution cycles by means of additional transmissions from the sending station which replace the calculated cell intensity values with an actual value for that cell. During the high resolution phase, an error determination routine or external input from a viewer selects those cells containing the greatest deviation in intensity levels from the input video image. The error compression and expansion routines substitute a plurality of individual pixel intensity values for single cell intensity values. The present invention also discloses a means for allowing color capable stations to send or receive color transmissions while retaining the capability to interact with noncolor stations. Color data is compressed and interleaved with black and white data by a color capable sending station and subsequently separated and expanded by a color capable receiving station. This invention relates generally to a broadband data compression/expansion system and more particularly, to an improved system for rapid transmission of black/white and colol video images via telephone lines for use in teleconferencing applications. The rapid transmission, reception, and display by commercial television stations and receivers of quality television images composed of 106 pixels or more with a satisfactory number of gray intensity levels per pixel is commonplace. However, a substantial bandwidth of several megahertz is required for transmission of complete data with respect to the gray-level intensity of each pixel. The cost to obtain this bandwidth is prohibitive for certain business applications like teleconferencing. It is common in the art to use narrow bandwidth mediums, such as telephone lines, to transmit these television images. However, the television images are necessarily transmitted more slowly over the narrow bandwidth media. Certain techniques were developed to accommodate high data rate sources to narrow band communication channels. These techniques have been integrated into systems which have particular application to the transmission of video information over voice grade communications channels at a data rate that can be accommodated in the limited bandwidth available. Such systems are sometimes called "slow scan" television systems. It is well known in the art to use slow scan systems for certain applications like security or surveillance where high resolution is not required. In such systems, a frame of 128 pixels by 128 pixels with each pixel being represented by sixteen gray levels can be transmitted in 128 x 128 x 4 bits = 2 x 2 7 x 2 2 = 2 16 bits. Such a system is embodied in the Robot Model 530 produced by Robot Research Inc. of San Diego, California. However, these systems are capable of only low resolution and cannot process high quality video images of a 480 x 640 pixel array with 64 gray levels or 225 x 2 13 bits. Moreover, such security systems do not posses the ability to automatically improve resolution. The time necessary for present slow scan systems using current compression schemes to transmit sufficient information for a video presentation of acceptable quality requires in the order of 90 to 120 seconds per display frame at transmission rates of 9600 bits/sec. For example, a normal video picture requires about 2 million bits of information. At the normal rate of transfer of 9,600 bits per second over telephone lines, approximately 200 seconds are required to reassemble a complete video picture of satisfactory quality. This process has proven to be too time consuming for many teleconferencing applications. Therefore, various data compression methodologies were developed in order to reduce the time to transmit an image. The prior art discloses several attempts to reduce this transmission time by decreasing resolution. For example, the Slow Scan Receiver/Transceiver Model 285C manufactured by Colorado Video, Inc. provides a resolution of 256 lines by 512 lines with 8 bits per pixel. At 9600 bits/second, this device requires 111 seconds to transmit a video image. Another technique is run-length encoding. In run-length encoding, the source image is raster scanned and a message is transmitted containing the value of a particular pixel and the length of the serial run of pixels with that value. However, for certain images, run-length encoding will increase the amount of data to be transmitted. See L. Grim, "Reversible Image Compression" 86-89 (1980) (dissertation). According to the prior art, it is also possible to dispose of or "throw away" certain less informative bits of data and transmit the remaining data to a receiving station where replacement data is calculated and added back to form a complete picture. This shortens the time to produce a single frame. U.S. Patent No. 4,222,076, entitled "Progressive Image Transmission" -- Knowlton, discloses a method for calculating a 16 x 16 matrix to describe the gray level intensity produced by adjoining pixels. However, the technique disclosed requires extensive calculations and exceeds the capabilities of all but the most expensive computers. Moreover, Knowlton does not disclose any means for selectively improving the resolution of a portion of the image. The data compression/expansion techniques taught in the prior art are generally time consuming and provides only a low resolution capability which is unsuited for graphics video standards which require high resolution. Moreover, these techniques often require that the sending and receiving stations share the same video standard. It is desired that a teleconferencing system be independent of video standards. Also, while the prior art does disclose certain techniques for automatically updating an output image, the prior art does not teach the use of dynamic external inputs by the viewer to concentrate the resolution power of the invention. For example, it would be desirable for an operator to be able to signal the machine as to the portion of the screen on which the resolution power should be focused. This feature would allow a viewer to determine which of the many portions of a figure are illegible or need.further resolution. Those areas could then be designated, thereby permitting greater viewer satisfaction. The prior art also discloses few uses of color in teleconferencing. The reason is that existing technology requires a total of six million bits of information in order to accommodate red, blue and green images. These six million bits would require up to six hundred seconds to transmit. This is too long a time to be useful in most teleconferencing applications. What is needed to satisfy teleconferencing requirement is a timely means for providing transmission and display of an analog-type color picture using digital data. It is thus a principal object of the present invention to generate a low resolution video image of sufficient quality to permit immediate review and analysis by viewers. It is also an object of the invention to provide a means for automatically updating the low resolution image. It is a further object of the invention to automatically add higher resolution to selected portions of the image. It is yet another object of the present invention to allow the user to select those portions of the initial image where high resolution will be performed first. It is yet another object of the present invention to provide an image generated by digital data which resembles an analog output. It is yet another object of the present invention to allow color as well as black/white images to be communicated rapidly. It is yet another object of the present invention to permit color and non-color stations to interact. It is yet another object of the present invention to permit a sending station to communicate with a plurality of receiving stations. It is yet another object of the present invention to provide a teleconferencing system which is independent of video standards. According to the present invention, there is provided a method of transmitting broad band information from a source over a narrow band transmission medium, for display at a destination remote from the source, in which method data representing such broad band information provided by the source is processed to reduce the data to be transmitted over the narrow band transmission medium, the processed data which is transmitted being used at the destination to generate further data representative of the broad band information, the information represented by the futher data and the information represented by the transmitted data being displayed at the destination. The present invention provides an improved two phase means for rapidly compressing, expanding, and displaying broad band information which is transmitted over a narrow band communications channel. This invention is particularly directed at improving the present means for communicating video images among a plurality of teleconferencing stations over telephone lines. This invention discloses a means for providing an image in two phases: Low Resolution and High Resolution. During the first phase, a low resolution image is generated and updated according to the results of several cycles of a data compression routine and a subsequent data expansion routine. Resolution is improved during the second High Resolution phase. In the preferred embodiment, the sending station transmits a gray level value for a single predetermined pixel in certain selected cells during the first cycle in the Low Resolution phase. The receiving station expands this value by assigning the value to the entire cell and then "filling in" neighboring cells and individual pixel values according to a data expansion routine. As the receiving station calculates cell and pixel values, the station stores the value in RAM. As the pixels are assigned values, a first display is generated. During second and third cycles in this phase, actual cell values for the remaining cells are transmitted and expanded. These cell values are then used to update the frame being displayed. Higher resolution is then obtained during the second phase by substituting a plurality of pixel values for the previously transmitted single pixel value for those cells having the greatest deviation in intensity values from the input video image according to an error determination, compression, and expansion routines. In an alternative embodiment, the image processor determines the average intensity of each cell that has been previously read by the raster scanner and stored in RAM. The average intensity value for certain selected cells is transmitted by the sending station to a receiving station which expands the transmitted data to fill in values for all remaining cells and pixels, values which are then stored in a memory of the receiving station and displayed. In the second and third cycles, image resolution is improved by replacing calculated cell intensity values with actual cell intensity values and recalculating the values of untransmitted cells and pixels. During the High Resolution phase, average cell intensity values are replaced by intensity values for selected smaller cells and ultimately, individual pixels, according to an error routine whereby higher resolution data is calculated by the sending image processor and is provided for those cells containing the greatest variation in the intensity of individual pixels. In an alternative embodiment that does not use the error determination routine to identify initially those areas most in need of higher resolution, any user may exercise dynamic control over higher resolution of any portion of the image by use of manually manipulated controls. In another alternative embodiment of the present invention, color data is compressed and is transmitted as the least significant bit in the six bit value for intensity. If the receiving station has a color capability, the color data transmitted from the sending station will be separated, expanded and added to the output image at the receiving station. If the receiving station is monochrome, the output image will be monochrome and the random color data contained in the least significant bit will have a negligible effect on the output monochrome image. Also, a color-capable receiving station ignores the least significant bit from a monochrome station and produces an image with 32 instead of 64 levels of gray 'level sending intensity. FIG. 2 is a schematic diagram of a single display frame. FIG. 3 is a schematic diagram of a single cell. FIG. 4 is a flow diagram illustrating the phases and routines utilized in the present invention. FIG. 5 is a flow diagram illustrating the preferred embodiment of the data compression routine and the data expansion routine in the Low Resolution phase. FIG. 6A is a block diagram of a map of cells whose values were transmitted during the first cycle of data compression routine. FIG. 6B is a block diagram of a map of cells whose values were transmitted during the first and second cycles. FIG. 6C is a block diagram of cells whose values were transmitted during the first, second, and third cycles. FIG. 7 is a schematic diagram illustrating the determination of untransmitted pixel data within a cell. FIG. 8 is a flow diagram illustrating the preferred embodiment of the error compression routine and the error expansion routine in the high resolution phase. FIG. 9 is a flow diagram illustrating the alternate embodiment of the data compression routine and the data expansion routine in the Low Resolution phase. FIG. 10 is a block diagram of an alternative embodiment of the present invention which includes a color interface. FIG. 11 is a schematic diagram of the color interface at a sending station. FIG. 1 is a block diagram of the present invention. Two stations 2 and 4 each capable of sending and receiving narrow band transmissions are shown. For this discussion, the first station 2 shall be designated the sending station. The second station 4 shall be designated the receiving station. The sending station 2 contains a raster scanner 10, a random access memory 14, an image processor 18, a display means 22 and a transceiver 26. The receiving station also contains a raster scanner 12, a random access memory 16, an image processor 20, a display means 24 and a transceiver 28. Each station is connected to other stations via a low frequency data transmission channel 30. The sending raster scanner 10 assigns digital values to represent the intensity of the image being scanned. Typically, a frame is composed of 640 pixels per line, 480 lines per frame, or a total of 225 X 213 pixels. Each pixel can be assigned one of 64 gray level intensity values, which can be represented in 6 bits. The digitized output of the raster scanner 10 is stored in memory 14 according to a predetermined cell structure. FIG. 2 illustrates that structure. A frame 40, stored in memory 14, is divided into cells with an aspect ratio of 4:3. FIG. 3 illustrates the construction of a single cell 42 with corner pixels designated as UL (upper left) 44, UR (upper right) 46, LL (lower left) 48, and LR (lower right) 50. FIG. 4 is a flow diagram of the Low Resolution and High Resolution phases and the associated routines utilized in transmitting a final image from the sending station and receiving it at the receiving station. In Phase I, Low Resolution, the sending station transmits a single six-bit word of data to describe the gray-level intensity of selected cells in the display 52. The data transmitted is selected according to a data compression routine 54. Two different data compression routines are described below. The receiving station image processor 20 expands this data by means of a data expansion routine 56 in order to fill remaining cells. Two different data expansion routines are described below. A display 58 is then generated at the receiving station. While the receiving station image processor 20 is performing the data expansion routine, the sending station image processor 18 is also performing the same data expansion routine 60. The sending station image processor 18 performs this calculation for the execution of the error determination routine. The sending station then employs an error determination routine 62 to determine the difference between the calculated pixel values and the transmitted pixel values for each cell. The errors and the associated cells are prioritized by error magnitude and stored in the sending station memory. As soon as the sending station 2 has completed an initial cycle of the data compression routine 54, the data expansion routine 60, and error determination routine 62, the sending station begins a second cycle 64 and transmits data for additional cells according to additional instructions in the data compression routine. The receiving station 4 uses the data expansion routine 66 to update the display 68. Meanwhile, the sending station 2 executes the data expansion routine 70 and the error determination routine 72 and again stores the results. The sending station 2 begins the third cycle 74 and transmits a value for each of the remaining cells as determined by the data compression routine 74 and the receiving station 4 uses the data expansion routine 76 to update the values of the cells and pixels in the display 78. Meanwhile the sending station 2, executes a final data expansion routine 80 and then a final error determination routine 82. Following transmission of the final cell values, the sending station 2 enters Phase II, High Resolution, and executes the error compression routine 94. The errors assigned to each cell and stored in memory by the error determination routines 62, 72 and 82 are examined by the sending station error compression routine 94. Those cells with the greatest errors are compressed first and are transmitted to the receiving station error expansion routine 96, which expands the data and calculates individual pixel values for all 12 pixels within the cell. A high resolution display 98 is generated by replacing the selected single values for all pixels within each cell with individual pixel values as determined by the error expansion routine 96. The High Resolution phase of the present invention can also be controlled by viewer input 80 either at the sending station 88 or the receiving station 90. As disclosed in U.S. Patent Application 3,617,630, entitled "Superimposed Dynamic Television Display System" and U.S. Patent Application No. 480,652, entitled "System for Sensing Spatial Coordinates" filed March 31, 1983, both of which are assigned to the assignee of the present invention Interand Corporation, the user may employ a manually movable probe to superimpose a visual image upon a display at the sending station 84 or the receiving station 86. For example, a particular section in the display can be circled with the probe. The receiving and sending stations will then execute the error routine for the circled area first. This image can then be used to prioritize areas of the image which are to be updated first. In the Low Resolution phase, compression and expansion routines should follow the same methodology. Two different methodologies are presented below. Both have an initial cycle whereby the sending station 2 transmits a six bit code representing the intensity of alternate cells on alternate lines to the receiving station 4 which in turn employs an expansion routine to fill in remaining cells. Two subsequent cycles are then executed to generate a six bit code for alternate cells on the skipped lines and then for all remaining cells. In both routines, Phase I involves the transmission of a total of 6 bits of data for 160 X 160 cells or 153,600 bits of data in three stages. At a transmission rate of 9600 bits/ sec, Phase I consumes about 16 seconds. In the preferred embodiment of the data compression routine, the sending station image processor 18 establishs the value of the UL pixel of each cell as the value for all pixels in that particular cell. Referring to FIG. 5, during the first cycle 100 of the data compression routine 54, the sending station 2 transmits a value for alternate cells on alternate lines 106. Those values had been read previously in block 102 and stored in block 104. FIG.6A illustrates the cells whose values are transmitted in the first cycle. The receiving station image processor 20 "fills in" the other incomplete cells according to a data expansion routine 56. FIG. 7 illustrates the execution of the data expansion routine 56 for an untransmitted UL pixel, Pn,m, where Pn-l,m and Pn+l,m represent the transmitted data for UL pixels to the left and right of UL pixel Pn,m. where Pn,m-1 and Pn,m+1 represent the UL pixel of cells above and below UL pixel Pn,m. After the UL pixels have been calculated for all cells in a line, the 11 remaining pixels in each cell, as shown in FIG. 7, are calculated in block 112 by the following "nearest neighbor" interpolation. The result is that the value of alternate cells on alternate lines can be transmitted in about 4 seconds over a 9600 bit/second line. (80 horizontal cells X 80 vertical cells X 6 bits per cell/9600 bits/sec = 4 sec for 9600 bits/sec transmission). As the data expansion routine fills in the remaining cells, a complete image will be produced at the receiving station display 114. The image is continuous in appearance and has enough detail to provide the user with a "starting look" at the image. The image is smooth not "digital" and is far more pleasing and informative than a "digital" image. During the second cycle 116 of the data compression routine 64, the sending station transmits the UL value for every other cell in the missing lines 118. FIG. 6B illustrates the cells whose values have been transmitted during the first and second cycles. Once the UL values have been recalculated by the 'receiving station in block 120, the other 11 pixels in each cell are calculated in block 122 for every cell in order to improve resolution and smoothness of the display 124. It should be noted that the same amount of data is transmitted in the second cycle as was transmitted in the first cycle. During the third cycle 126 of the data compression routine 74, the UL pixels of the remaining cells are transmitted 128. FIG. 6C illustrates the cells transmitted during each of the three cycles. All 11 pixels of each cell are once again calculated in block 130 by the data expansion routine and the display 132 is updated. The third cycle requires as much time as the first and second cycles combined. Following the transmission of the values of the remaining cells, the High Resolution phase is executed. In the preferred embodiment of the error determination routines 62, 72 and 82, the sending station 2 calculates the absolute differences between the UL pixel and each of the remaining 11 pixels in each cell and stores in sending station memory the largest difference for each cell. Where there are large differences between a transmitted cell value and the individual pixels in that cell, the error routine replaces those single cell values with individual pixel values, beginning with the cell with the largest variation. The techniques of transmitting cells with largest errors first has several advantages. First, the great majority of cells, 80 to 90 percent, have error levels of 1 or 2 and only 10 to 20 percent have larger error values. It is precisely the 10 to 20 percent of those cells that provides needed detail. By transmitting those cells first, the user is able to see detail more quickly. T The error compression routine 94 reduces the transmission from two million bits or two hundred seconds over a 9600 bit/second modem to about two hundred thousand bits or twenty seconds, assuming that ten percent of the cells have significant errors. Referring to Table l, tests have shown that for most images, less than 10 percent of the cells have errors in excess of 7 levels of intensity out of a possible 64. Consequently, it is possible to group all cells with errors of 7 or greater into one group of 7. This compression requires only 3 bits of memory per cell to store an error value for each cell. Tests have also shown that reducing the error below a figure of 1 produces little noticeable improvement in the displayed image. Table 1 shows that for error levels of 4, 2 and 1, the number of bits to be transmitted is reduced by permitting an error of +1, +1, and ±1, respectively. An error of 1 indicates that the single intensity value assigned to that cell is within one level of intensity of each pixel in the cell. On a scale of 64 intensity levels, changing a level by 1 has a negligible effect. Because 1 is an acceptable error level, the error compression routine 94 will add a sufficient number of pixels to the cell to ensure that the maximum difference between the last displayed value and any cell pixel is no more than 1 level of intensity. 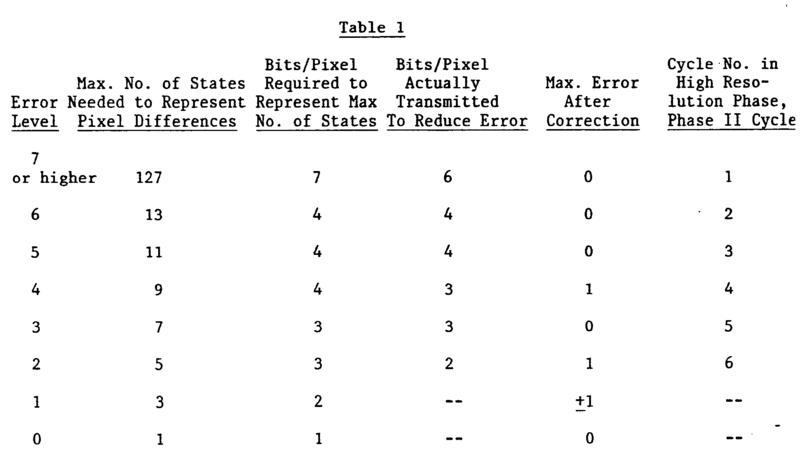 - Table 1 illustrates the number of bits required to be transmitted in order to describe the number of states which will satisfy the possible range of error messages. The error compression routine 94 is executed in 6 cycles, beginning with the largest errors and finishing with those cells having the lowest errors. In the first cycle 140, the actual 6 bit value of the remaining 11 pixels in the cell are transmitted for cells with an error level equal to 7 or higher. In cycle 2 142 and cycle 3 144, only 4 bits/pixel are transmitted in order to absolutely define the 11 remaining pixels in the cell for cells with errors equal to 6 or 5. In cycle 4 146, 4 bits/pixel are required to describe the 9 possible error values (-4 to 0 to +4). However, assuming that errors of +1 are negligible, the number of states can be reduced to 8 which permits the use of 3 bits/ pixel to define the remaining pixels. Reducing the number of bits to be transferred saves time, especially because a larger number of error values can be expected at the lower error levels. In cycle 5 148, cells with errors equal to 3 are transmitted with 3 bits/ pixel to absolutely define all pixels. In cycle 6 150, a maximum error of 1 is permitted in order to permit cells with errors equal to 2 to be transmitted with 2 bits/ pixel. Finally, cells with error levels of 1 are omitted because tests show they add little detail to the final image and cells with errors of 0 need not be transmitted. The error compression routine 94 must also output a cell location in addition to the cell correction data. This is achieved by including a variable length jump code as a header to the correction data for each cell. The code is interpreted by the error expansion routine 96 to indicate the horizontal and vertical displacement of the cell from the previous corrected cell. The jump code adds an average of only 10 percent more data to the error compression routine 94 output data, and hence increases transmission time by 10 percent. In an alternative embodiment to the data compression, data expansion, and error routines of the preferred embodiment which rely on the UL pixel value, the average intensity of each twelve pixel cell is calculated and used in place of the intensity of the UL pixel. Referring to FIG. 9, the average intensity of each cell is determined in block 205 during the first cycle of the data compression routine 200. The data expansion routine 56 then calculates cell and individual pixel values in the same manner as described in the preferred embodiment. The error compression routine 94 and error expansion routine 96 outputs and receives data for 12 pixels rather than for 11 pixels. This increases the time required to execute the High Resolution Phase II. There is however improvement in the visual quality of the image in the alternative embodiment during each of the 3 cycles of phase I and for most images there is a slight reduction in error level for many cells. It should be pointed out that in either the preferred embodiment, or in the alternative embodiment, the error compression routine 94 and error expansion routine 96 need not output or receive data for all pixels within a cell. The error compression routine 94 may output data for one third or one half of the pixels in a cell in order to further reduce the amount of data required to improve the cell. The error expansion routine 96 will correct the pixels defined by the error compression routine 94 and then calculate the intensity values of the remaining pixels by interpolation. This results in a significant decrease in transmission time, but increases the calculations required at the receiving station. It is a unique aspect of the invention that the sending station 2 and the receiving station 4 are video standards independent. That is the sending station 2 may operate and output to displays which are a different video standard than the receiving station 4. The video standard applies only to the manner in which the sending station random access memory 14 and receiving station random access memory 16 are raster scanned for the display 22, 24. The raster scan of the random access memories 14, 16 or the encoding of a video input to memories 14, 16 in no way affects any of the above mentioned compression/expansion routines. Thus, the sending station 2 may reside in the USA and operate on a 525 line/60 HZ standard and the receiving station may reside in Europe and operate on a 625 line/50 HZ standard and vice-versa. Furthermore, as will be shown below, it is also a unique aspect of the invention that sending and receiving stations may be monochrome or color and that color stations are also standard independent. In an alternative embodiment of the present invention, color information can be compressed and expanded by a color interface 15 at the sending station 3 and a color interface 17 at the receiving station 5 as shown in FIG. 10. The color system shown in FIG. 11 could be present in a sending station, a receiving station or both. Only when it is present in both stations will the receiving station be capable of producing a color display. It will be evident from the detailed description below, sending station 3 utilizes both the color transmission and color receiption capabilities of this embodiment. The receiving station 5 utilizes only the color reception capabilities. For clarity, the color reception capabilities will be described as part of the color sending station 3. It should be obvious however that the color reception capabilities of the receiving station 5 will mirror those of the color sending station 3. The preferred embodiment discloses the use of six bits of data to represent 64 levels of gray level intensity. In order to add a color capability, the sixth or the least significant bit is used to store color data. It should be noted that the color embodiment described below incorporates all the features of the preferred monochrome embodiment described above. While representing color in a single bit plane is low resolution compared to black and white information which uses five bits, tests have shown that the reduction of one bit plane in high resolution monochrome systems degrades the system very little. The human eye has far greater sensitivity to the luminance portion of an image (bits one through five) than to the chromonance portion of the image (bit six). Referring to FIG. 11, it is well known in the art to compress the red 150, green 152 and blue 154 inputs of a color input source 11 by forming a luminance signal Y 158 and two color difference signals R-Y 160 and B-Y 162 by means of a color matrix encoder 156. It is evident that the luminance signal is the monochrome or black and white video signal when there is no chrominance that is, when G=R=B, R-Y and B-Y = 0. The first stage of color compression occurs when a switch 164 controlled by the raster scan timer 166 passes either the red color difference signal R-Y 160 or the blue color difference signal B-Y 162 to the chrominance analog to digital convertor (ADC) 168. Switch 164 is an alternate line switch which alternately passes either the red difference or the blue difference signal for a particular scan line. The chrominance ADC 168 digitizes the analog output of switch 164 to four bits or 16 levels of intensity. The parallel output of the chrominance ADC 168 is rearranged to a serial output by the parallel to serial convertor 174. While the encoded red and blue difference signals 160, 162 are being routed to the switch 164, the luminance signal Y 158 is passed through an 8 pixel analog delay 170 and input to the luminance analog to digital convertor (ADC) 172. The luminance ADC 172 converts the intensity of each of the 640 samples contained on a horizontal line into a 5 bit value signifying 32 levels of greyscale intensity. The luminance signal Y 158 is digitized at high resolution, i.e., 640 pixels/ line, 480 lines/frame, 5 bits/pixel. An additional color compression occurs when the chrominance ADC 168 digitizes the output of the Switch 164. The chrominance ADC 168 operates at 1/4 the sampling frequency of the luminance ADC 172. The chrominance ADC 168 produces 160 color difference samples per line as opposed to 640 samples per line for the luminance ADC 172. The output of the chrominance ADC 168 then passes to a parallel to serial convertor 174 which serializes the 4 parallel color bits to one serial output 178. The result is that 160 samples with an associated 4 bit chrominance value are converted into 640 serial bits per line and is stored in a single bit plane in the random access memory 14. The serial output 178 of the convertor 174 has 640 'bits per scan line and is synchronized as 2° with the 640 pixels of 5 bits of data per line, 21-25. The 5 bits of data, 21-25, which are output by the luminance ADC 172, are transferred from the sending station color interface 15 via lines 176 a-3 and are stored as the 5 most significant bits in the sending station random access memory 14. The contents of the sending station random access memory 14 are communicated by a sending station image processor 18 and transceiver 26 to a monochrome or color receiving station 4, 5. In addition to communicating the contents of the sending station random access memory 14 to a receiving station, the color sending station 3 also uses the color data stored in memory 14 to produce a sending station color display 23. The description below describes the production of a color display 23 with respect to the sending station 3. However, it should be evident that the receiving station color display 25 is produced in the same manner from the color data transmitted by the color sending station 3 and stored in the receiving station random access memory 16. If the receiving station 5 did not have a color interface 17 and hence was a monochrome receiving station 4, the monochrome receiving station's output would be negligibly affected by the color difference data. Also, if a monochrome sending station 2 transmits to a color receiving station 5, the color receiving station 5 will store a zero code in the least significant bit plane. Because there is no color difference data stored in the color receiving station random access memory 16, the final output of the color receiving station 5, as seen on the color display 25, is monochrome. Referring to FIG. 11, the 5 most significant bits 21-25 are output on lines 180 a-e from the random access memory 14 to a 5 bit luminance DAC 184 where the analog luminance signal Y is output on line 186. The least significant bit 2° passes along line 182 to a serial to parallel convertor 188. The output of convertor 188 is provided directly to switch 194 by lines 190a-d and also provided to switch 196 by lines 192 a-d. The output of convertor 188 is also directed to the one line delay 198. The delay 198 has the ability to store the four bit chrominance values for an entire line. Total storage is thus 640 bits. When a new line is directed from the convertor 188 to the delay 198, the delay 198 outputs the stored chrominance values for the previous line along lines 192 a-d to switch 194 and switch 196. If the initial color difference chosen by the raster scan timer 166 and switch 164 was the red difference signal, the delay would store the red difference values, R-Y 160, for that line until the values for the next line, B-Y 162, were output to the delay 198 by the convertor 188. The values are subsequently output to the sending station color display 23. As noted above, the receiving station mirrors the sending station and produces a similar output on the receiving station color display 25. The least significant bit plane in color systems holds the color data. In the data expansion routines 60, 70, 80 in the error compression routine 94 discussed earlier, some of the color bits were transmitted. The only cells with possible undefined color bits are for cycles 4 and 6 and for those cells whose error level equalled 1. To complete the final color transmission, it is necessary only to update those cells which still have errors. In an alternative embodiment, the color data is interleaved with the monochrome transmission by transmitting first the most significant color bit, then the next most significant bit and so on. It is another unique aspect that the color transmission capability of any particular teleconferencing station can fully interact with any non-color station and vice-versa. Therefore, when a color station trasmits to a non-color station, the non-color station disregards the sixth bit of information, the color information. Likewise, when a black and white station transmits to a color station, the color station receives a code indicating that the subsequent transmission in monochrome. The color receiving station then processes only five bits of information and therefore displays monochrome, not color, image. The capability of the present invention can be greatly expanded by improved microprocessor technology. At present, a 8085 microprocessor is used. As larger microprocessors become available, the image processing will be further improved. For example, the 8085 microprocessor requires about two seconds to write in the two million bits in the screen. Larger microprocessors process data much faster. Thus, processing time is less critical. The present sixteen seconds necessary to update an image would be reduced significantly if cell size were quadrupled from the present four by three cell to an eight by six cell. Another aspect of the present invention is that it permits a viewer at the receiving station to determine within four seconds if the picture is the correct one. In other words, a viewer may determine from the initial four second picture that the camera should be shifted right or le to another item. It should be noted that the receiving station contains a serial buffer to temporarily store and delay the initial generation of the receive station display. This permits the receiving station to output the first cycle of low resolution Phase I to the display in less than 4 seconds it takes for the transmission to reach the receiving station over a transmission line with a capacity of 9600 bits/second. Consequently, although a viewer at the receive station must wait at least four seconds to see the entire first cycle of Phase I, the viewer sees the entire image appear on the receiving station display in two seconds or less. This causes the viewer to believe that the transmission requires less time than it actually does. It is a further point of the invention that the sequence of sending data is not important. For example, the color map may be sent first and error information updated next. It is a further point of the invention that a viewer may use manual controls to select those areas in which color resolution, like monochrome resolution, is to be increased. It should be clear that a sending station can transmit data to a plurality of receiving stations where the receiving stations and the sending stations operate at different image input standards and may be either color or monochrome stations. Furthermore, all stations can serve as either sending stations or receiving stations interchangeably. Obvious applications of the present invention are in the areas of medicine, teleconferencing, and surveillance. In medicine, this technique can be used to tag certain areas of X-rays where additional detail is required. For example, a doctor who is viewing a image may desire that certain areas be increased in resolution in order to highlight certain figures. Further, it should be apparent that various changes, alterations, and modifications may be made to the embodiments illustrated and described herein without departing from the spirit and scope of the present invention as defined in the appended claims. 1. A method.of transmitting broad band information from a source over a narrow band transmission medium, for display at a destination remote from the source, in which method data representing such broad band information provided by the source is processed to reduce the data to be transmitted over the narrow band transmission medium, the processed data which is transmitted being used at the destination to generate further data representative of the broad band information, the information represented by the further data and the information represented by the transmitted data being displayed at the destination. and the corrected data is used to up-date the displayed information. 3. A method as claimed in claim 2, in which the data reduction routine of the first phase is carried out in a plurality of cycles, processed data outputted at the end of each cycle being transmitted successively over the narrow band transmission medium to the destination, further data generated at the destination being generated successively using the successively transmitted data and being used to up-date the displayed information. generating such further data using the transmitted digital values. 5. A method as claimed in claims 3 and 4, wherein the arrangement of cells comprises a plurality of lines and wherein such digital values for alternate cells on alternate lines are transmitted during an initial one of the plurality of cycles. 6. A method as claimed in claim 4 or 5, wherein the transmitted digital values are either (a) the values for a respective predetermined pixel in each of the selected ones of the cells, or (b) an average value for pixels in respective selected ones of the cells. 7. A method as claimed in claim 4, 5 or 6, wherein the further data is generated by calculating such digital values for pixels not transmitted, using the transmitted digital values. 8. A method as claimed in claims 2 and 7, wherein the error determination routine calculates differences between the calculated pixel values and the transmitted pixel values for each cell, in a plurality of cycles, and stores the greatest such difference for each cell. 9. A method as claimed in claim 8, wherein the cell with the greatest such stored difference is selected by the error data reduction routine, the error data from such a cell being transmitted to the destination in an initial one of a plurality of cycles, error data to be subsequently transmitted being selected successively in accordance with decreasing such stored differences. 10. A method as claimed in claim 9, wherein the corrected data generation routine calculates such digital values for individual pixels, in a plurality of cycles, from the error data to provide the corrected data. 11. A method as claimed in any preceding claim, wherein the broad band information is an image formed of pixels and including colour information, in which method chrominance data is reduced, transmitted and generated to provide a colour display at the destination. 12. A method as claimed in claim 11, wherein the data representing such broad band information is in the form of a plurality of bits for each pixel, one of the bits representing chrominance data and the remaining bits representing luminance data. 13. A method as claimed in claim 4, or in any of claims 5 to 12 when appendant thereto, wherein said digital grey level values for each pixel are defined in 64 levels. 14. A method as claimed in claim 11 or 12, wherein the chrominance data is represented by red difference and blue difference values, defined in 16 levels of intensity. and a display means for displaying information represented by the transmitted data and by the further data. and wherein the receiving station further includes corrected data generation means to which is inputted the reduced error data and which is capable of outputting corrected data for updating the information displayed on the display means. 17. An apparatus as claimed in claim 14, 15 or 16, the broad band information comprising an image formed of pixels wherein the sending station includes scanning means for scanning the image to determine the grey level digital values of each pixel; storage means for storing such digital values; logic means for grouping the pixels into an arrangement of cells, each cell containing a plurality of pixels; the first processing means including decision means for selecting and transmitting such digital values relating to the information in each of a plurality of selected ones of the cells via the narrow band transmission medium to the receiving station. 18. An apparatus as claimed in claim 17, the image being a colour image, wherein the scanning means is capable of determining chrominance and luminance digital values for each pixel, the second processing means being such that where the display means is a colour display means a colour image is displayed at the receiving station, and where the display means is a monochrome display means a monochrome image is displayed at the receiving station. NL8901504A (en) * 1989-06-14 1991-01-02 Philips Nv Television signal encoding. Inventor name: TAM, RAPHAEL K.
Inventor name: KARLIN, RICHARD A.